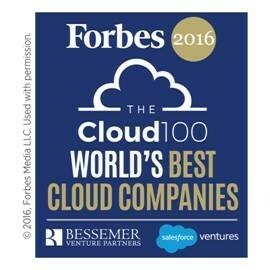 NEW YORK–Sisense, the business intelligence market disrupter for simplifying business analytics for complex data, today was named to the first-ever Forbes 2016 Cloud 100, the definitive list of the top 100 private cloud companies in the world, developed in partnership with Bessemer Venture Partners. To view the list, please visit www.forbes.com/cloud100. The list will appear in the October 4, 2016 issue of Forbes magazine. We’re thrilled to be included in the inaugural Forbes 2016 Cloud 100 list as one of the most promising and fast-growing companies of today. The industry overall, and analytics as part of it, is shifting to the software-as-a-service (SaaS) model, which provides great value and cost efficiency to customers. Sisense is proud to be with the leaders of this movement with a very high customer satisfaction and over a 100% renewal rate. We believe that this recognition from Forbes further proves our strides in this area, simplifying business insights from complex data, provided in the form of software as a service. This recognition from Forbes builds on several recent awards wins and recognition for the company in the past several months, including: 50 Highest Rated Private Cloud Computing Companies to Work for list from Glassdoor and Battery Ventures; 2016 Frost & Sullivan Customer Service Excellence Recognition; 2016 Industry Excellence Award Recipients from Dresner; CRN 2016 Big Data 100: 50 Coolest Business Analytics Vendors; 2015 Total Cost of Ownership (TCOO) Supplier Award from Celestica – Best IT Partner; and “Perfect Recommend” in Dresner’s 2016 Wisdom of Crowds Business Intelligence Market Study. Forbes, in partnership with Bessemer Venture Partners, received hundreds of submissions to identify the most promising private companies in the cloud. The Forbes 2016 Cloud 100 was selected by a panel of judges representing leading public cloud companies, using qualitative and quantitative data submitted by nominees, along with publically available third-party data sources. Sisense simplifies business analytics for complex data. Powered by its unique In-Chip™ and Single Stack™ technologies – Sisense delivers unmatched performance, agility and value, eliminating much of the costly data preparation traditionally needed with business analytics tools and providing a single, complete tool to analyze and visualize large, disparate data sets without IT resources. With more than one thousand customers in over 50 countries, including global brands like Target and Samsung, Sisense was recently designated a hot company to watch by CIO, CRN and Information Management and recognized as one of the “10 Most Innovative IT Ventures” at Under the Radar. Its solution won the “Audience Choice” award at the O’Reilly Strata conference and its CTO won the World Technology Award for the invention of In-Chip analytics.